SAVE $$$ WITH NATURAL GAS AND COMMUNITY WATER SYSTEM…over 1 Acre…Grand Oaks Building Site 174 X 308… beautiful wooded site…fairly flat…in neighborhood of very nice family homes. Petoskey Schools. Only about 4 miles to Petoskey. 1,400 sq. ft. + home. Save $10,000 because of $500 tap in fee for water vs a well! Builder available to build your sparkling NEW Home! Meadow View Farm includes 30 acres, a charming five bedroom farm house which was extensively remodeled in 2001. A great barn complete with box stalls and the Glorie Be building, which once was a charming little store. Enjoy lovely perennial gardens and views of beautiful meadows. The pastures are fenced and ready for your animals. 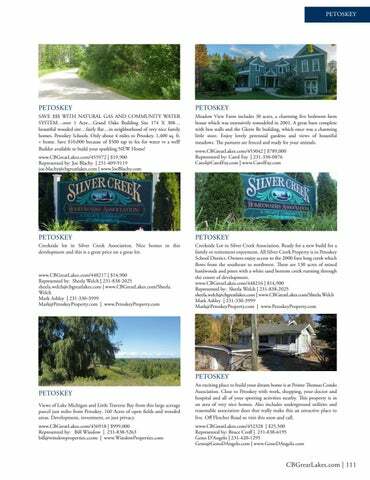 Creekside lot in Silver Creek Association. Nice homes in this development and this is a great price on a great lot.